Hey guys i was at a show a few weeks ago and came across a NOS no1 mk3 stock i picked it up for a steal at $150 complete , i also asked about if he had anymore and i picked up another one same price . As i have a couple of projects going they will never go astray . I also picked up a ag Parker no 9 sight and bracket for cheap , missing a couple of bolts but nothing that cant be picked up . 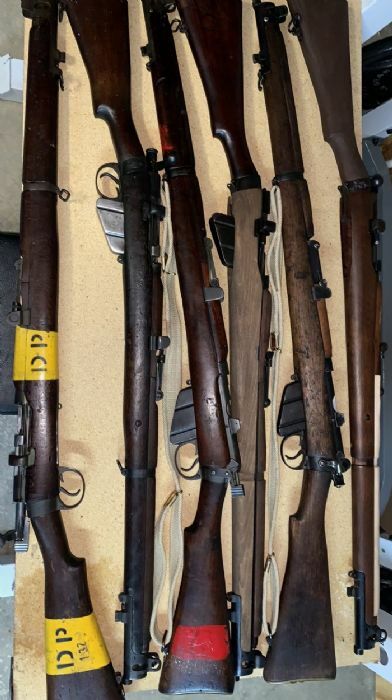 I have in the pictures from the top a 1913 sn160volley sights ,1914 sn x5669 , 1914 sn12045 sporter being bought back to milspec,1915 sn 37575,1916 ftr53 sn ????? And the dp on the bottom is a 1940 that is going to be a wall hanger fora tributes wall . I also just picked up a 1942 h barrel maybe a tribute sniper coming up . Let me know what you all think the dp rifle barely closes on the no go and does not shut on the field at all ?? Jammy devil! I'm still searching for mine. Re the DP, it doesn't matter, its DP, as in Drill Purposes ONLY! sorry this isn't coming out right at all. But don't even think about firing a DP, please. No chance of firing the dp its destined for a tribute wall i will clean her up deactivate the bolt (no spring or pin ) I wish that i kept my slouch hat it would be part of it if i had it , my dads is back in Aussie my family has served in the Aussie army ,air force and navy since the boer war through to Vietnam , i was in from 87-90 still have life long friends from those days .